Wilson Electronics is a pioneer in cellular signal boosters. They were there for the dawn of the cell booster era, and they’ve worked hard with their partners at the FCC to make sure that cell boosters are safe and available to everyone. That’s why it’s really exciting when they come up with a new product. You know it’s going to be really good. 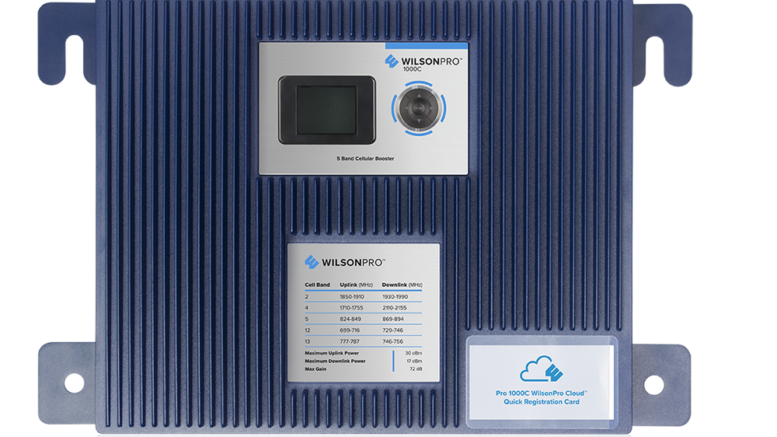 The Wilson PRO 1000c is the amplifier part of an industrial distributed antenna system. It’s the core of an entire cell booster system. The system works with nearly unlimited users in a very large space. Wilson builds amplifiers like this for professional installation. This is the thing you need when you really need good cell service in an office. The Pro 1000c is a revision of the existing Pro 1000, which will still be available. The Pro 1000 already provides the maximum allowable power, configurable on a band-by-band basis. It’s configured to support an area up to 35,000 square feet. It’s the top of the line for Wilson’s cell booster line. Now, it adds cloud support. Why is cloud support important? These amplifiers are designed to be installed and monitored by professionals. Most of the time, they’re self-configuring. They “just work.” However, if they go down, that’s a big problem. Over 100 people could lose cell service. It could be something as simple as a loose plug, or it could be some sort of hardware issue. It could be that a local cell tower is having trouble or a new tower is causing an overload. No matter what the problem, chances are there isn’t going to be someone staring at the amplifier to see what it is. Busy installer and maintenance professionals monitor these cellular amplifers. They watch thousands of pieces of equipment from a lot of locations. That’s where the cloud comes in. The Pro 1000c connects to a wired connection or works with available LTE networking. Either way, it connects to Wilson’s servers where you can check the health of the amplifer with your phone. You can get an alert if something’s wrong, and hopefully deal with it before people even know it’s a problem. Having cloud support lets the people who supervise these amplifier be exactly where they need to be, right when they need to be there. The sophisticated cloud service can even detect the 1000c’s online status. It sends messages to the amplifier and waits for it to respond. If the amplifier doesn’t respon, the cloud service will send an alert. Perhaps the network connection is down. It could be that the device is unplugged, or it could be something else. The installer will know that they have to go down and check it. You won’t find this system on Amazon. In fact almost no one can sell it online. We have a special exemption because we have trained professionals who can help you configure it. Even so, you can’t just “add to cart.” You can see the specs here, but in order to get a Wilson PRO 1000c, you’ll need to call in. Our techs will help you build the system you need. Then we will send you everything you need for a proper install. We can even help you find an installer in your area.